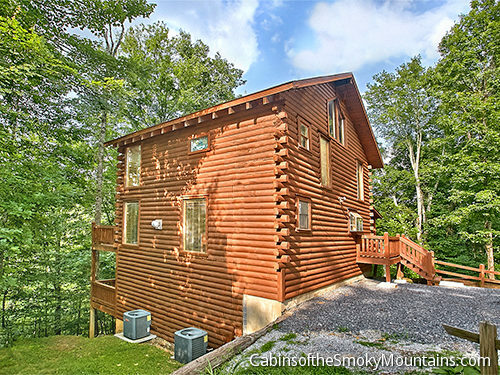 Indigo Moon Lodge is a spacious 1-bedroom luxury cabin with three levels offering room to sleep up to 8 people comfortably. 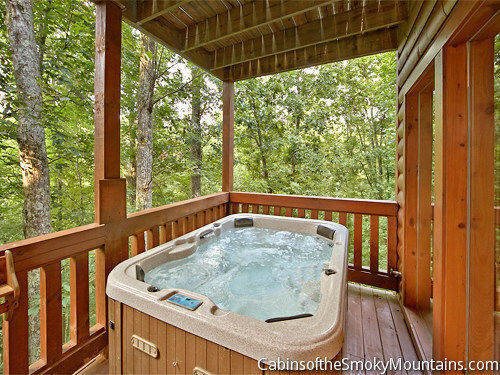 It has one master bedroom with an open plan loft area second bed, two full bathrooms with an extra half bathroom, and amenities that include a deck hot tub, an indoor jacuzzi, and even your own private sauna. Located in the woods outside of Pigeon Forge, Tennessee, Indigo Moon Lodge has an open plan design made even more luxurious by a wall of windows looking onto the trees outside. It’s a casual, romantic place for a couple simply to hang out in, with room to wander round, and places to perch everywhere. 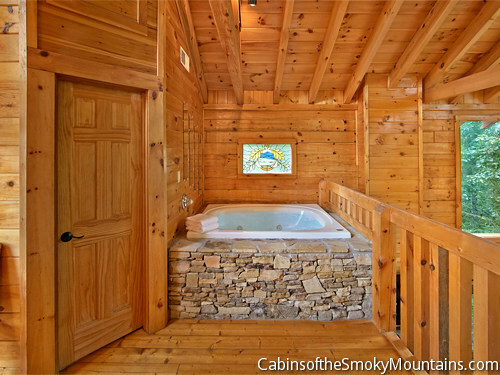 There’s a pool table on the lower level, with the hot tub outside sheltered on a deck, and the sauna inside next to the master bedroom. Upstairs is a foosball table, close to the kitchen area to work up an appetite, and the dining and main living area. 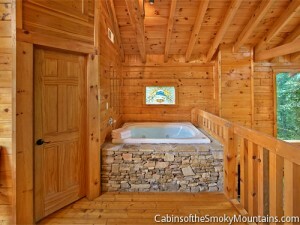 Upstairs again, a king bed in the open plan loft area, with jacuzzi. 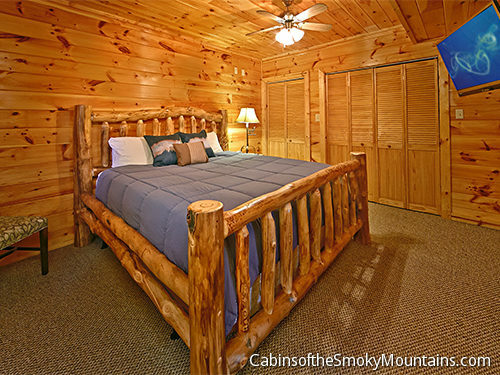 The cabin is big enough for a group of friends or family to gather, with the second king and two queen sleepers besides the master king bed, and room to accommodate it all. If it’s hot outside, dual air conditioners make sure it’s just right inside. 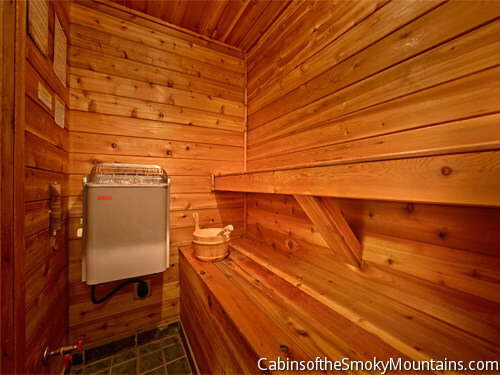 Meanwhile, between the sauna to dry out, the jacuzzi to refresh, and the hot tub to boost the inner being, human body climate control is pretty adjustable too. 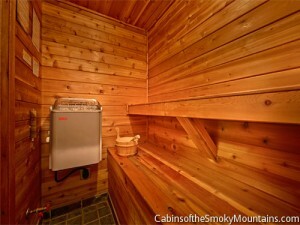 Hot or cold, the trees remain through all weathers, and the mass of windows allows you to share in it at all times. 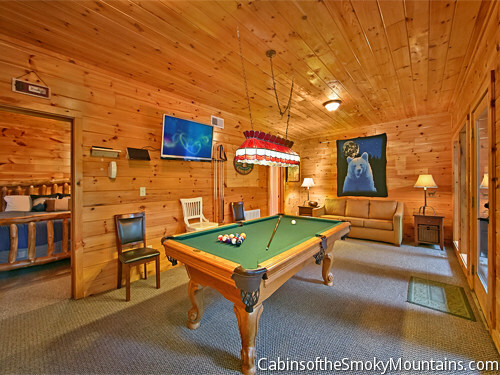 For indoor entertainment, there’s WiFi and two flat-screen HDTVs, and a gas fireplace for hunkering down. 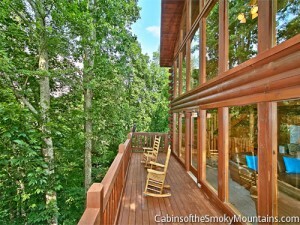 Only a little ways outdoors, there’s a charcoal grill to cook a bite to eat, and a full kitchen for backup. 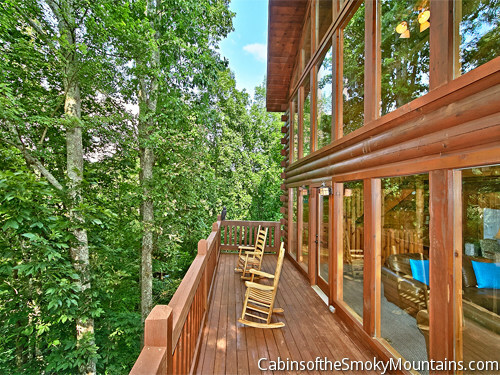 A little further outdoors, a few minutes in the car, there’s Dollywood and Pigeon Forge, with all the excitement of town, and Gatlinburg just a few minutes further. That’s if you can leave. 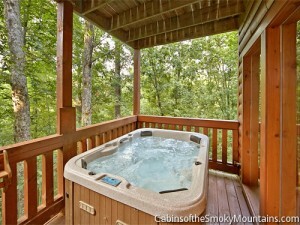 People come to the Smoky Mountains for numerous reasons. Not everyone chooses to live exclusively in the cabin, sometimes you have to go to town. 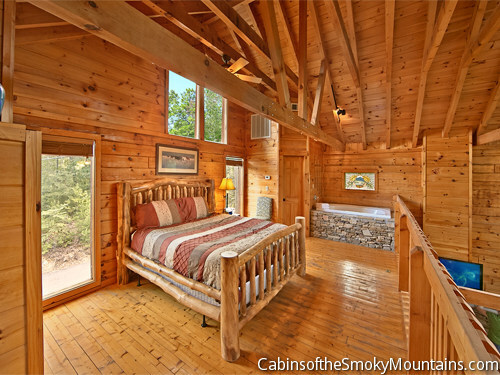 In fact, many people come for the town experience, but choose the affordability and privacy of a cabin over a hotel room (TIP: check our Specials page for our frequent cut-rate deals). 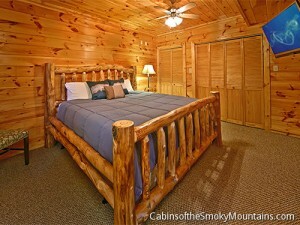 Either way, Indigo Moon Lodge has you covered. 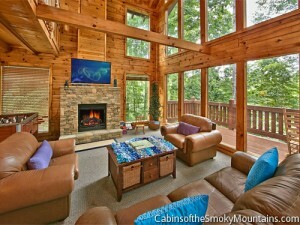 Come as a couple or a family or group of friends, and stay as long as you can. Run to town if you wish, or simply lounge, in every corner of this hugely hospitable cabin. And hurry back! 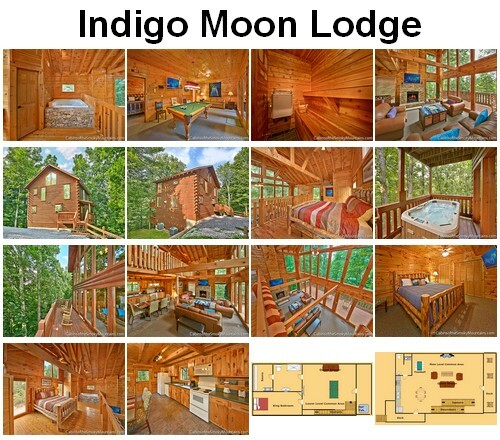 Click here to check availability and book Indigo Moon Lodge for your next trip!